To learn Greek you really have to have some knowledge of the alphabet, so get practicing!^__^ I placed lines so you can learn 'till every line (like I once did), not everything in one time...If you have problems, contact me whenever you wish! 2005-03-19 [Ranasha]: ghehe :P go look at my new drawing! 2006-07-24 [Nuit Darksin]: should i write that down? 2006-08-01 [Janouk]: What do you mean? 2006-08-02 [Janouk]: Oh! ^^ I think the best way is to start with recognising the characters. Just like the ABC. Alpha, Bèta, Gamma, Delta etc. You can also start trying to write the symbols down, but maybe I should make a new lesson about that someday. 2006-10-31 [SilverFire]: do the accents on the vowels act the same way as macrons do in for Latin vowels? A macron, from Greek μακρός (makros) meaning "large", is a diacritic ¯ placed over a vowel originally to indicate that the vowel is long. The opposite is a breve ˘, used to indicate a short vowel. Wouldn't this mean it already existed back then? 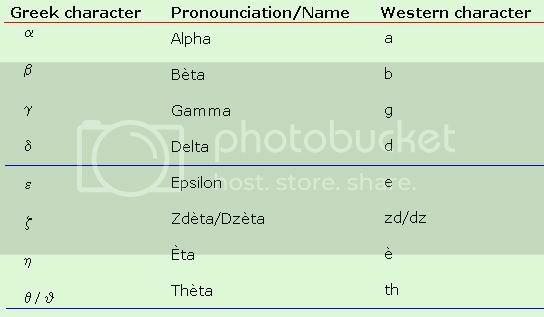 2007-07-02 [Adela Leafshanks]: When I started learning ancient greek, I found it hard to distuingish between xi and zeta, so I just called xi 'squiggly' and left it at that XD 'Twas most amusing.